Looking for a sensational alpine holiday destination nestled 6km below the peak of Mt Kosciuszko, you can even get married at the top ! This lovely alpine village is not only the the best ski resort in all of Australia with a delightful European charm, it is a great place, a unique place for a wedding. Millions of visitors routinely come to Thredbo all year round, for spectacular winter skiing and summer adventures. The Snowy Mountains provide scenic views and fabulous terrain for skiing, biking, camping, and trekking. 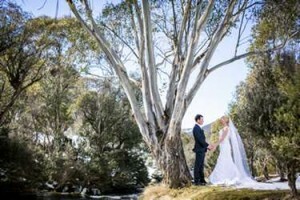 The spectacular scenery at Thredbo makes this a dream wedding location. Few places can rival the beauty and stunning landscapes at Thredbo. Couples looking for the most romantic place to wed, entertain guests, and honeymoon, will be thrilled with this fantastic village. There are endless ceremony spots, luxurious accommodation, gourmet cuisine, and unparalleled wedding photography settings. Thredbo is vibrant throughout the year, with every season packed full of thrilling events and adventures. You may therefore wed any time in winter or summer, and take advantage of the great entertainment to keep your guests thrilled. You can opt for the snow in winter or wildflowers in summer. Whatever the season, each wedding venue is equally wondrous. Thredbo is so beautiful, almost every location is ideal for a wedding! From mountain summits to riverside locations, Thredbo is awash with venues begging to host your wedding. However, some locations will simply blow your mind. One perfect venue is Fire Dreaming. 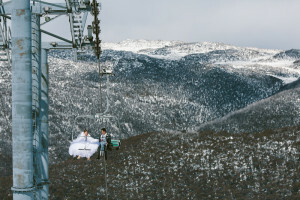 This is the most breathtaking wedding location in Thredbo. Fire Dreaming is a spectacular 5 bedroom chalet, which is situated on 900 square meters of secluded property adjacent to the pristine Kosciuszko National Park. It has the biggest living, dinning, and lounge area in all of Thredbo, along with magnificent gardens. It also has two huge deck areas, one of which is an enclosed marquee perfect for wedding functions. Wedding ceremonies of between 20-80 people can be comfortably hosted here. The Top of the Kosciuszko Chairlift, with breathtaking mountain views. The Ecumenical Chapel overlooking Thredbo River. Thredbo has everything you need to make the perfect wedding. This includes professional photographers, vintage bridal vehicles,clothing hire, expert florists, and decorators. There are also highly experienced beauticians and hairdressers, to ensure you look fabulous on your special day. You can also unwind and get pampered at the spa, to calm your nerves before the big day. This unique village has all types of accommodation to fit your wedding needs. Whether it’s a small wedding or a huge ceremony with many guests, Thredbo has ample accommodation to fit them all. These include lovely chalets, lodges, and apartments. Your guests will have a lovely time at Thredbo too, and can extend their stay to ski or mountain bike in the wild. Numerous festivals come to Thredbo too, offering great concerts to entertain everyone. Our staff will help you organize the perfect wedding. Their expertise and experience will make your wedding arrangements a breeze. This will allow you to enjoy yourself and celebrate your love. Extensive reception and honeymoon packages are available as well, which can be tailored to match your needs and budget. 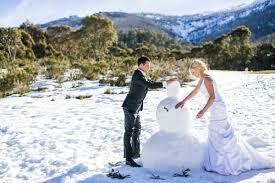 Make your wedding and honeymoon the most memorable moment in your life by coming to Thredbo. There is simply no better place on earth to say I do.